The 1996 World Series of Poker main event saw the arrival of two rising stars at their very first main event final table. Those two players were aggressive young player Huck Seed, and Vietnamese immigrant Men “The Master” Nguyen. These two players survived past Steven Beam (ninth), Fernando Fisdel (eighth), and J.P. Schmalz (seventh). Joining those two among the final six for television from the initial field of 295 were Andre Boyer, An Tran, Bruce Van Horn, and a usual suspect at the main event final table, John Bonetti. Nguyen had already won a bracelet that ($2,500 Omaha eight-or-better), and finished runner up in a second event ($1,500 Omaha), while Bonetti booked a runner-up finish in the $5,000 limit hold’em event. 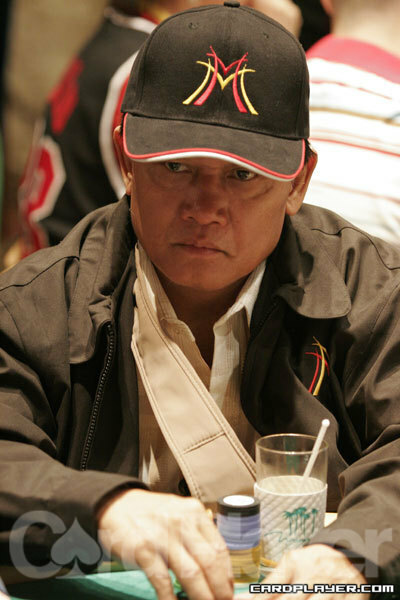 Other professional players who joined Nguyen as a bracelet winner that year were David Chiu ($2,000 limit hold’em), “Miami” John Cernuto ($1,500 seven-card stud eight-or-better), Randy Holland ($1,500 razz), Al Krux ($1,500 pot-limit hold’em), Freddy Deeb ($5,000 deuce-to-seven lowball), Hans “Tuna” Lund ($1,500 ace-to-five lowball), Sam Farha ($2,500 pot-limit Omaha), Barbara Enright ($2,500 pot-limit hold’em), Tony Ma ($5,000 limit hold’em), and Susie Issacs ($1,000 ladies seven-card stud). The three aggressive professionals at the final television table (Nguyen, Seed, and Bonetti) lived up to their billing and took over the pace of play from the very start. They overpowered the other three players until they chose to dig in their feet and take a stand. The first of those to do so was Van Horn, who called down a 30,000 raise from Bonetti preflop with Q-J. The flop was dealt Q-J-5 and Van Horn checked. Bonetti fired out 40,000 and Van Horn decided to raise an additional 60,000. Bonetti made the call with pocket kings, and although he received no help on the turn or river, he call down bets of 170,000 and an all-in bet of 125,000 from Van Horn. This gave Van Horn a very nice double up success in the end, while Bonetti was knocked down to his last legs. Even with the short stack he managed to survive past the eliminations of Boyer in sixth place and Tran in fifth place. With action four handed, Seed found another level of aggression and attacked pots preflop in almost every hand. On one of those hands Nguyen woke up with A-K and he quickly called against Seed’s preflop all-in raise. Seed showed down J-6 but the board was dealt 7-5-4-9-8 to give Seed a straight, which eventually sent Nguyen out of the tournament in fourth place a few hands later. The result of a case of tilt that saw Nguyen move all in on three consecutive hands (on the last hand his 9-8 ran into the A-Q of Bonetti). Shortly after three-handed play got started Bonetti and his pocket threes ran right smack dab into the middle of Seed and pocket jacks. The loss crippled Bonetti to the point where he tried to make a move with A-3 on a short stack. Van Horn called him down with A-J to eliminate Bonetti in third place. Van Horn took a 2-to-1 chip lead into the heads-up match, but that quickly diminished when he was dealt A-J once again, and faced a reraise all in from Seed. Van Horn called Seed down and Seed flipped over pocket queens to double up. This now gave Seed the chip advantage to go with his distinct advantage in experience. The end came a short time later, when Van Horn raised 80,000 preflop and the flop was dealt 9 8 4 . Seed led the action with a 120,000 bet and Van Horn raised 210,000 more. Seed reraised all in and Van Horn put his tournament life on the line with a call. They turned up their hands and Seed held 9 8 for two pair, while Van Horn was behind with K 8 . The turn and river brought no help and Seed was the 1996 world champion.